According to the Bureau of Labor Statistics, the mean annual and hourly salary of CNAs in TN, as on May 2013, was $23,110 and $11.11 respectively. The number of nurse aides working in this year was 28,860 and the employment per 1000 jobs was 10.69. As per indeed.com, the average CNA salary in Tennessee was reported to be 7% lower than the average salaries nationwide. Thus, their average annual salary amounted to $23,000 as of January 2015. 90% of CNAs made less than $29,990; 10% made more than $29,990. 75% of certified nurse assistants received less than $26,380; remaining 25% earned more than $26,380. 50% of the employees were paid less than $22,520; rest 50% earned more than $22,520. 25% of CNAs were waged less than $19,700; 75% were waged more than $19,700. 10% of employees were offered less than $17,150; 90% were offered more than $17,150. 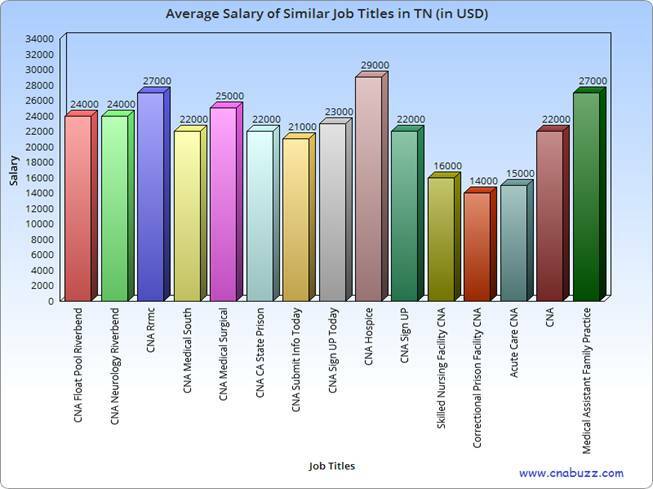 After observing the table below, it can be concluded that the salaries of a certified nursing assistant varies in different cities of TN. Being the lowest paying city, Jackson offered $25,227 (median yearly salary) to these professionals, in January 2015. The median monthly income and median hourly pay of CNAs in this city were reported to be $2,102 and $12 respectively. Germantown and Memphis offered the highest salary of $29,183 per annum, $2,432 per month and $14 per hour. Professionals, who worked as CNA Hospice, managed to earn $29,000 in January 2015. CNA Rrmc and Medical Assistant Family Practice made $27,000. Correctional Prison Facility CNA earned the lowest income, i.e. $14,000. In between 2012 and 2022, around 312,200 new positions will be generated for nurse aide aspirants. As indicated by the BLS, the job opportunities for certified nursing assistants are projected to grow by 21 percent in these years. There is a huge demand for health care services in the long-term care facilities due to growing elderly population. However, demand of CNAs may be constrained, as a number of nursing homes rely on government funding. Question 1 – Presently, I am working as a CNA in the Murfreesboro city of TN, and planning to move to Hendersonville. Is there any difference in the annual salaries offered in these cities? Answer – Yes. There is a huge salary difference between both these cities. Generally, CNAs working in Hendersonville city earn an annual salary of $29,038. Question 2 – Can anyone suggest me a few highest paying job titles in the state of Tennessee? Answer – In Tennessee, the highest paying job title is CNA Hospice, who earn an annual salary of $29,000. Other highest paying job titles are Medical Assistant Family Practice ($27,000), CNA Rrmc ($27,000), and CNA Medical Surgical ($25,000).